Raymarine c-Series c125 multifunction display is the last word in the MFD (multifunction displays) market. 12.5" sunlight viewable LCD display, Wi-Fi and Bluetooth networking that provide control functions from your smartphone or tablet to the c125 chartplotter. This c125 Model (T70038) is already preloaded with Canada charts. The Raymarine c125 chartplotter is perfect for all types of sail and power boats featuring a bright power saving LED backlighting LCD screen that is viewable in direct sunlight, incredible networking capabilities and excellent powerful user experience. The c-Series c125 MFD has a high sensitivity built-in GPS receiver and includes two Micro SD slots for added Navionics maps. This c125 (T70038) is ready to navigate with Canadian Cartography. The c125 Multifunction display has advanced networking capabilities consisting on a built-in Wi-Fi and Bluetooth Wireless. This feature allows you to view the c125 chatplotter screens on your iPhone, Ipad or Android tablets and Smart phones by streaming the video to them. The c125 can also control music playback from your MP3 player or from your smartphone using Bluetooth control right from the MFD. The c125 also supports wired networking including SeaTalkhs, SeaTalkng, NMEA2000, NMEA 0183 and has one composite video input. It is possible to network up to 6 displays together and match them with other Raymarine devices like AIS transceivers, marine and thermal imaging cameras, SIRIUS weather receivers (only USA), HD Color radar scanners and more. Using the RCU-3 Bluetooth Remote Controller (sold separately) is providing control capabilities of your c125 display right from the. The Raymarine c125 Network Multifuction Dispaly includes a rubberized protective sun cover, flush mounting kit, power/data/video cable, installation guide and a multi-language handbook on CD-ROM. 12.5” sunlight viewable LED backlighting LCD display. Dual Micro SD slots for added Navionics charts on microSD card. Wi-Fi video streaming and waypoint synchronization with iPhone and iPad or Android Tablets and Smartphones. Network up to 6 displays using SeaTalkhs technology. Mix and match any combination of C-Series or E-Series displays. Composite video input for entertainment source, marine camera or thermal imager. Fast and easy control using LightHouse User Interface keypad. SeaTalk HS 1 x SeaTalk HS port 100 Mbits/s. Micronet connection. SeaTalk NG 1 X SeaTalk NG connection Adaptable to NMEA2000 Devicenet. Fuse/Breakers 7A. Standard 20mm glass fuse. In-line fuse fitted within power cable. 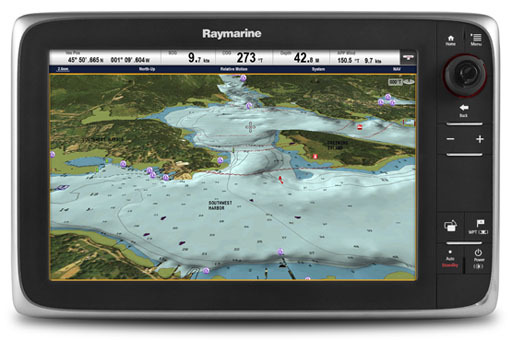 Click the button below to add the Raymarine c125 Multifunction Display w/ Canada Charts - T70038 to your wish list.